Rapid development in information dissemination across the internet has contributed largely towards aneurysm clips adoption and disease treatment adoption. Clinical management information, availability of aneurysm clips, pricing, defects in aneurysm clips material biocompatibility, physician feedback, R&D, etc. all categories of information are accessible to the common public through open source sites. This raises patient interest and leads to active physician and patient relationship management to better patient outcomes. Last but not the least, active contribution to aneurysm clips market information by some of the leading manufacturers makes the process of information dissemination simpler and positively contributes towards the expansion of revenue at a steady pace across the aneurysm clips market. The adoption of aneurysm clips is majorly fuelled by improved access to healthcare facilities across the world. Previously, aneurysm clips were manufactured with materials traditionally considered biologically inert such as silver. Over time metals such as cobalt and titanium have made their way into the aneurysm clips market. Aneurysm clips are versatile, safe, and are widely available in a variety of shapes and sizes. Some aneurysm clips widely adopted are Yasargil and Sugita - reflect the closing pressure of between 0.88-1.08N (90-110g) and 0.69N (70g), respectively. These aneurysm clips are temporary clips. Thus, product evolution due to technological advancement is expected to contribute to the revenue growth of the aneurysm clips market despite the availability of alternative treatment options. Aneurysm clips are priced competitively across markets. The wide availability of product assortment by material type and technology type are factors that contribute towards competitive product pricing. 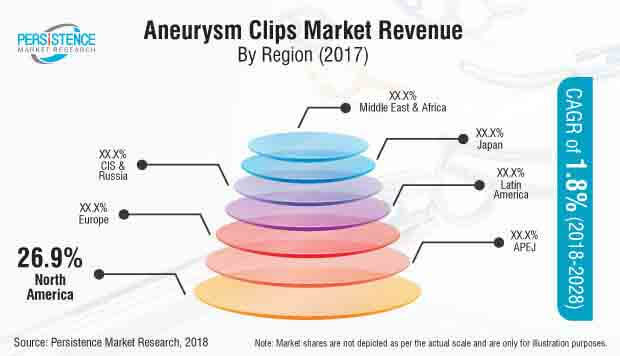 The average pricing of aneurysm clips is low across the analyzed countries, which boosts adoption of the product. The market is fragmented at the bottom and largely consolidated at the top, leading to a monopolistically competitive setup and competitive product pricing. The pricing in low-cost settings in the emerging markets is quite low due to the availability of both branded and locally manufactured products. However, pricing is high in developed markets especially products of B. Braun in the country like the U.S. Stringent regulatory compliances are creating major hindrances for the overall growth of the global neurointerventional devices market which has further restricted the growth of the global aneurysm clips market. As per the 21 CFR, Part 807 of FDA, manufacturers, and distributors must register their establishments with FDA. Companies need to adhere to strict regulatory compliances and have to pass through stringent clinical trials to launch their products in the U.S. – the major revenue generating market. In markets with low-cost setups, often aneurysm clips with unknown biocompatibility and metallurgic patterns have been used. Smaller manufacturers in aneurysm clips market lack adequate quality control procedures, especially for testing clip closing pressures. This had led to fatal incidences due to uncontrollable hemorrhage. Thus, the American Society for Testing and Materials Committee has enforced strict guidelines for brain clip biocompatibility and measurement of clip closing forces. There are also stringent norms to ensure bio magnetic compatibility to avoid unfavorable incidence and boost patient safety. This factor is majorly responsible for hampering the growth of the global aneurysm clips market. As indicated through various sources B. Braun is the market leader for the production of aneurysm clips globally. Yasirgil aneurysm clips enjoy the widest adoption globally. The company’s Aesculap division is reportedly the widest provider of the aneurysm clips globally and the product portfolio includes over 340 different aneurysm clips design and 38 appliers (Phynox, titanium, mini, standard, permanent, temporary and fenestrated). The company has been to note to have conducted 70% of the aneurysm clip product process by hand. This largely contributes towards error reduction and thus, the availability of such information ensures direction for future product development and driving the revenue growth of the global aneurysm clips market. The competition section in the report on the aneurysm clips market comprises profiles of the major players operating in the market based on their shares, product offerings, differential strategies, company dashboard, and marketing approach. B. Braun Melsungen AG (Aesculap USA), Peter LAZIC GmbH, AS Medizintechnik GmbH, Ortho-Medical GmbH, KLS Martin Group, Adeor Medical AG, Rebstock Instruments GmbH and ADCA – Indústria e Comércio de Material Cirúrgico Ltd are some of the key players featured in this report. The companies offer a wide range of aneurysm clips. The emerging players operating in the aneurysm clips market are majorly focusing on new marketing strategies in order to increase their product footprint in the global aneurysm clips market. An aneurysm clip is the most common surgical procedure used to treat an aneurysm. An aneurysm usually occurs when the artery wall becomes weak and creates a huge bulge in the artery. Aneurysm clip is an approach to treat an aneurysm by placing a metal clasp over the neck of an aneurysm. According to a study, it is estimated that around 13,000 deaths occur every year in the U.S. due to an aortic aneurysm. Generally, aneurysms vary in size and shape, therefore, aneurysm clips are made in a variety of shapes and sizes. The company conducted a research study on aneurysm clips market for the forecast period from 2018 to 2028. The report offers a comprehensive evaluation of the business opportunities in the aneurysm clips market along with insights on the aneurysm clips pricing analysis, brain aneurysm epidemiology study, list of key distributors and suppliers for aneurysm clips market. The report describes the macroeconomic factors influencing the dynamics of aneurysm clips market and its futuristic potential. The report offers a comprehensive taxonomy of the aneurysm clips market based on material type, indication, end user, and region. Based on material type, the global aneurysm clips market is segmented into titanium alloy, and cobalt chromium alloy. Based on indication, the global aneurysm clips market is segmented into saccular aneurysms and fusiform aneurysm. Based on end user, the aneurysm clips market is segmented into hospitals and neurology centres. The aneurysm clips market has been analyzed across regions, namely North America, Latin America, Europe, Asia Pacific excluding Japan, Japan, CIS & Russia, and Middle East & Africa (MEA). What is the revenue potential of aneurysm clips across emerging regions? Who are the key competitors in aneurysm clips market and what are their portfolios in the aneurysm clips market? What are major challenges influencing the growth of the aneurysm clips market? How intervention from regulatory authority is shaping the aneurysm clips market growth? The aneurysm clips devices market has been estimated based on company share analysis approach, whereas aneurysm clips market has been estimated based on company’s aneurysm clips revenue. Some of the factors studied during aneurysm clips market estimation include prices of aneurysm clips, brain aneurysm prevalence, adoption of aneurysm clips, and others. This information is further validated with rigorous primary research (including interviews, surveys, in-person interactions, and viewpoints of physicians) and secondary research (including authentic trade journals, verified paid sources, and resourceful databases). The research study on aneurysm clips market also includes top trends and macro-economic factors shaping the global aneurysm clips market. With this approach, the report on aneurysm clips market anticipates the industry attractiveness of every major segment in aneurysm clips over the forecast period.